I have another My Creative Time sneak peek for you, and you are going to love today's new products! I made my cute little window and shelf using the new Stitched Window Dies & Accessories! This set also comes with curtains, a window box, flower dies, and more, but I decided to go for a clean and simple look since I wanted to create a scene from inside a living room looking out on a winter day. Working from the outside in, I created some snowdrifts using the Fun Stitched Edges Dies, and added a couple of fir trees made with dies from Seasonal Greetings. After die cutting the window, I lay it upon some clear cardstock so that I could cut around it to create some "glass" that I could adhere behind the window frame. I made the holly with dies from Boughs of Holly, the flowers and pot with dies from Way to Go, the present with a die from All Around Holidays, and the little ornament with a die from Seasonal Greetings. The patterned paper I used is from an older Echo park 6x6 pack, Season's Greetings. On the inside I stamped a sentiment from the coordinating stamp set that I am sneaking today, Window Sentiments & Flowers. This stamp set has several images that coordinate with the dies, plus lots of sentiments using this lovely font. This card is 3 1/2" x 5". Love your card Katie!!!! The papers and colors are awesome!!!!! Very pretty! Love the poinsettia sitting on the window sill. Oh Katie, this is so adorable. Love the package and little bulb you placed next to the flowerpot on the sill. It's the perfect little scene for Christmas. Your card is so lovely!!! I love this. I'm a sucker for trees so when I saw the window I pretty much envisioned this card. Just beautiful. What a sweet card. It's such a warm feeling card. Good Job!!!! Great idea to create an inside scene looking out. Very pretty. Love the embellishments on the window sill and the trees outside. Hi there, I love your card is just beautiful, those dies are awesome, TFS. Cool card. Like the outside scene and the cute plant on the sill. Stunning creation! I love how cozy the view is! Perfect card for the winter season and holidays! Very pretty card, love it!!! So cute and I love the scene you created. Well done. Love this design!! The mini poinsettias on the window pane is super cute. This is so cute. Awesome card for the holidays!! Stunning- love the outdoor trees and indoor plants. Wow, you created a beautiful scene, it's just lovely. Love all the details. TFS! So cute both inside and outside the window. Love all the little details you added Katie. Great paper too! Emma uses such pretty fonts...the set today is pretty. 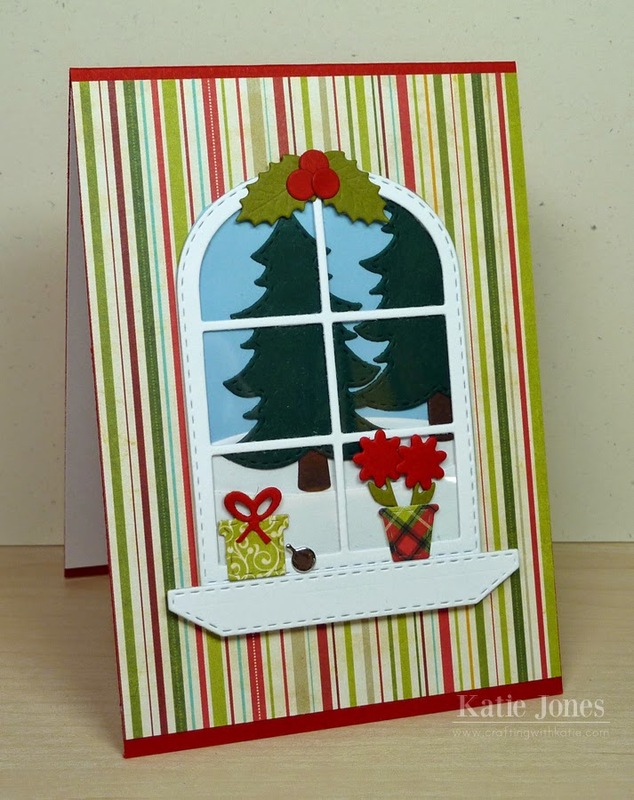 Love the window die and I like how you used it with pine trees and drifts. I like how you used the present, ornament and flower pot from other sets...great idea. Beautiful job. LOVE it! Thanks for sharing your CUTE card. 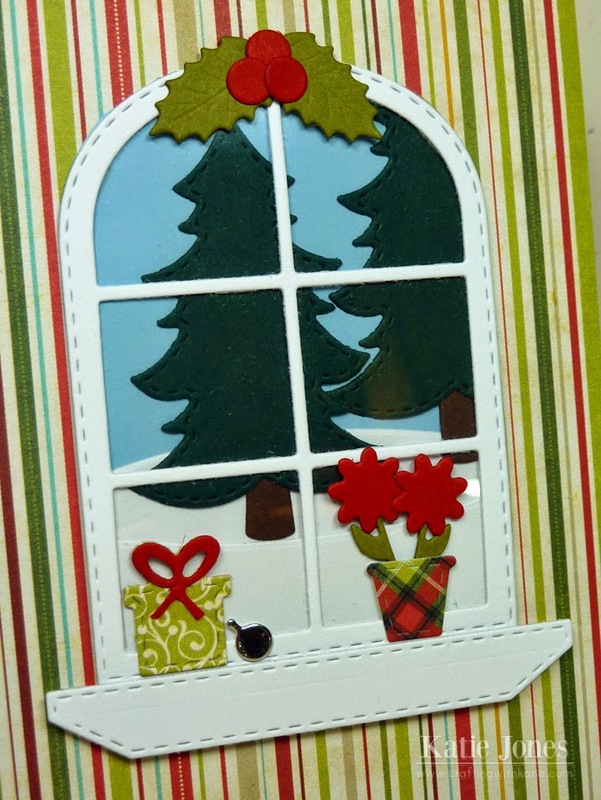 Super Cute Inside Looking Out Card! You Could Actually Feel The Warmth & Coziness Of Thisbolvera66@yahoo.com Scene!! What a pretty card! I love how you decorated the inside window sill as well as the outdoor scene! Sinks for sharing! Such a lovely card Katie! This new window die offers so many possibilities! TFS! This is so cute and I love the papers that you used and the cute little present on the shelf!! Hugs!! I love your festive scene!!! That poinsettia, gift, the trees outside the window, and that garland or mistle toe are perfect! Beautiful card!!! Love the scene!! !